Bipasha And Karan’s Mehandi Photo Will take you to another world! 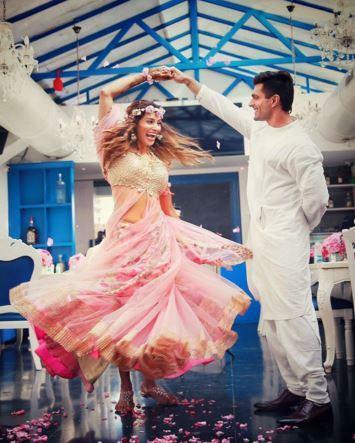 Bipasha and Karan’s wedding will take place today and we can’t be more excited to see their pictures.Yesterday they hosted a Mehandi and Sangeet and they both were make an outstanding couple. Karan and Bipasha took to Instagram and shared their Sangeet and Mehandi photos. Bipasha wore lovely outfit from Anushree Reddy and karan kept it simple in whote Kurta Pyjama. The decoration theme was pink and we totally loved it. Shilpa Shetty, Shamita Shetty were also the part of the celebration. We totally loved their adorable pictures. Congratulations guys!